The Turtles are sitting around the farmhouse in Northampton, watching TV. Donatello decides that everyone is becomming couch potatoes and Leo suggests that they should head over to Springfield, a nearby city that will offer them the chance to jump around on some buildings. The guys head out and after an enjoyable night of exploring, they hear some gun shots. As they rush to investigate, they run headlong into a caped crusader – who’s been shot in the arm. The man asks the Turtles to trail a truck that he had been staking out while he goes to treat his flesh wound. The TMNT are skeptical, but the fellow shows them a police badge, which convinces most of the guys that they should help. The costumed cop tells the Turtles to meet him at a nearby bridge at dawn. The TMNT hop onto the roof of the truck and ride it out to the parking lot of B.F.R. Trucking. Later, the Turtles are waiting for the vigilante cop to arrive on the bridge. As Raph snarls that they shouldn’t have trusted the guy, he arrives without a sound, actually catching the ninjas by surprise. The police officer is satisfied when he hears where the truck went and heads out. This upsets Raph some more and he demands to know why they should trust the caped crusader, and he’s met with equal suspicion from the man in black, who states that he’s taking a big chance trusting the Turtles. Nevertheless, the vigilante tells the TMNT to meet him at another bridge later that night if they want more info. Later that night, Leo meets with costumed police officer. Raph and the others are nearby, but hidden. The caped crimefighter explains that he’s been investigating a new salvage comapny in town ever since he couldn’t find out who owned the business. As he searched the grounds of the company, he was discovered by security guards and fired upon – that’s when he met the TMNT. Upon further investigation, utilizing the info the Turtles gave him, the cop learned that B.F.R. Trucking’s main client was Ruffington Arms, a munitions company with several large government contracts. The hero then tracked the same unmarked truck from B.F.R. that the TMNT had investigated and found that it had gone to Ruffington Arms, received a shipment, and then had gone back to the salvage yard once again. The crimefighter wants to know what kind of cargo the two companies are exchanging, so his plan is to stake out the salvage company once again and find out what they’re up to. 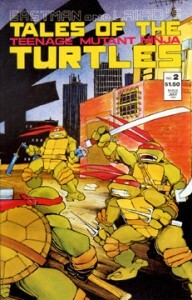 Leonardo tells the caped crusader that he can count on the Turtles’ help. That night the five heroes sneak into the salvage comapny’s grounds and discover that it’s packed full of guards. They gain a vantage point on a tall warehouse and see some large boxes through the skylight. Leonardo uses a grappling hook to snag the box and lift it to the rooftop. Raph pops the box open and inside they find a huge gun decked out with heavy artillery and the latest hi-tech gadgets. The costumed cop decides that it’s time to call his friends at the police station when two large limousines arrive. Suddenly workers haul off the boxes of guns to a nearby barge. The policeman is upset by how fast things are happening and tells the Turtles that it will be up to them to stop the guns from leaving. The TMNT head out to remove the threat of the security guards. The caped crimefighter spots a helicopter. Thinking that it’s a police craft, the costumed vigilante prepares to signal it – only to discover that it’s an unmarked aircraft. The helicopter lands on the barge and the cop decides that they’re going to fly the weapons out – and he has to prevent this! As the Turtles finish off the last of the guards and capture the men in the limousines, the caped crusader loads the big gun that they had found and fires a round at the helicopter… but he misses! With the weapons fully loaded onboard, the aircraft makes a run for it. The policeman takes aim and fires a second shot, this time he’s successful and the vehicle crashes into the river. Soon enough the police arrive in force and begin their investigation into the illegal sale of arms. As the Turtles watch from the safety of the rooftops, they lament that their new friend didn’t even say thanks. Leonardo dubs him “Nobody” since he never gave them his name.